Other-affirmation (thinking positively about the other party) seems to be a promising intervention for settling conflicts in which value differences are salient. Hypotheses from research on regulatory fit theory are evaluated in this study. 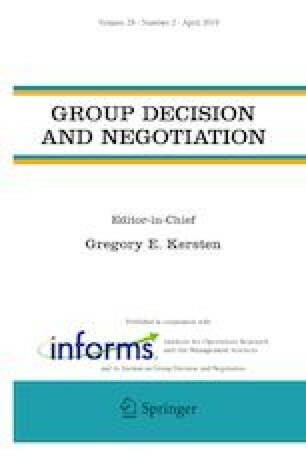 A 2 × 2 design combines pre-negotiation other-affirmation (as explicit or implicit) and mediator approach (as directive or facilitative). In support of the fit hypothesis, we showed that the implicit-directive combination produced the best joint outcomes. Directional findings showed that the fit between explicit affirmation and facilitative mediation also produced favorable outcomes. Uncertainty reduction was posited as a plausible explanation for these findings. Implications are suggested for interventions intended to resolve conflicts over resources derived from values. Thanks go to Mesut Altuntaş, Manon van Fulpen and Anoek Braam for their contributions to this study. To calculate Joint Outcomes we reversed the outcomes for the client (as indicated between brackets). A lower selling price indicates a better negotiation outcome for the client. which is reflected in the outcomes of the client. In my role as mediator, I will direct you to take a course that will put you and your counter-part on a path to agreement in the negotiation. You should attempt to find the best agreement for both of you. I strongly advise you to exchange proposals in an effort to find a solution that works for both of you. Think carefully about what will happen if the two of you do not find an agreement during the negotiation. If you do not settle, the case may go to court. And you may not like the judge’s decision. I will monitor the discussions and will be available when needed. The directive mediator also showed a strict, less friendly face and business-like manner. In my role as facilitator, I will help you to make progress in this negotiation. I am here to give advice and encourage you to reach an agreement that is best for both of you. My suggestion for you would be to exchange proposals in an effort to find a solution that works for both of you. You might want to think about what might happen if the two of you do not find an agreement during the negotiation. If you do not manage to settle, the case may go to court. And you may not like the judge’s decision. Please know that I am here for you when you need me. The facilitative mediator also conveyed a friendly, less strict, face or manner and tone of voice.